Opening Photoshop Elements for the first time is like moving into a new office. Before you begin work, you need to organize the office. In Elements terms, the office organization consists of specifying preference settings. Preferences are settings that provide a means to customize your work in Elements and to fine-tune the program according to your personal work habits. Elements has two Preferences dialog boxes: one in the Photo Editor workspace and another in the Organizer workspace. The Photo Editor’s Preferences dialog box organizes all the options into several panes. By default, when you open the Preferences dialog box, you see the General pane. To open the Preferences dialog box, choose Edit → Preferences → General (or Photoshop Elements Editor → Preferences → General on the Mac). Alternatively, press Ctrl+K (⌘+K on the Mac). Using either method opens the Preferences dialog box to the General pane. Panes list: Elements lists all the different panes along the left side of the Preferences dialog box. Click an item in the list to make the respective pane open on the right side of the dialog box. OK: Click OK to accept any changes made in any pane and dismiss the Preferences dialog box. Cancel: Click Cancel to return to the same settings as when you opened a pane and to dismiss the dialog box. Reset: Clicking the Reset button returns the dialog box to the same settings as when you opened the dialog box. The dialog box stays open for you to set new settings. Prev: Move to the previous pane. Next: Move to the next pane. Alternatively, you can jump to another pane by pressing Ctrl+(1 through 9) in Windows or pressing ⌘+(1 through 9) on the Mac. Of particular importance in the General tab are the items you see for Allow Floating Documents in Expert Mode and Enable Floating Document Window Docking. General preferences, as the name implies, apply to general settings you adjust for your editing environment. Saving Files preferences relate to options available for saving files. You can add extensions to filenames, save a file with layers or flatten layers, save files with image previews that appear when you’re viewing files as icons on your desktop (Windows), and save with some compatibility options. On the Mac, the Finder generates thumbnails automatically, so you don’t need to specify thumbnails in a Save dialog box. Performance preferences is the pane where you find history states and memory settings, such as scratch disk settings. You can monitor how your scratch preferences are working in the image window. Transparency preferences require an understanding of how Elements represents transparency. To display transparency in Elements, you need some method to represent transparent areas. Open the Transparency preferences and make choices for how transparency appears in Elements. Guides & Grid preferences offer options for gridline color, divisions, and subdivisions. A grid shows you nonprinting horizontal and vertical lines. You use a grid to align objects, type, and other elements. You can snap items to the gridlines to make aligning objects much easier. You can drag guides from the ruler and position them between gridlines. 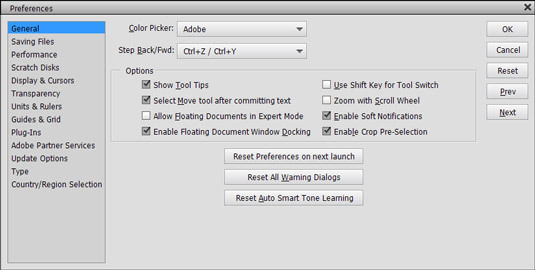 Plug-Ins preferences include options for selecting an additional Plug-Ins folder. Plug-ins are third-party utilities that work with Elements. There are many free plug-ins you can find on the Internet by searching for Photoshop Elements Plug-Ins. Adobe Partner Services enable you to control whether Elements automatically checks for new services, clears the online stored data, and resets your account information for all services. To get you started, Elements provides you with a number of preset libraries that you can load and use when you want. You can change libraries individually in respective panels where the items are used. The Preset Manager dialog box provides a central area where you can change libraries. Learn More About: The Preset Manager: Click the blue Preset Manager hyperlinked text to open the Help document and find out more about managing presets. 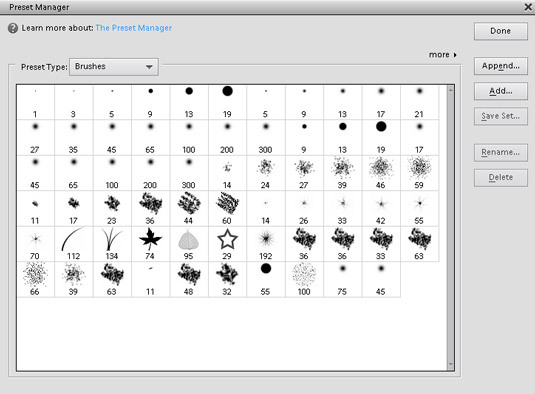 Preset Type: Open the drop-down list to choose from Brushes, Swatches, Gradients, and Patterns. More: The More drop-down list lists the viewing options. You can view the library items as text lists or as thumbnail views. Done: Any changes you make in the Preset Manager are recorded and saved when you click Done. Append: Click the Append button to append a library to the existing library open in the Preset Manager. Add: Click this button to open another library. Save Set: You can save any changes you make in the Preset Manager as a new library. If you make a change, use this option so that you don’t disturb the original presets. Rename: Each item in a library has a unique name. If you want to rename an item, click the thumbnail in the Preview pane, click Rename, and then type a new name in the dialog box that appears. Delete: Click an item in the Preview window and click Delete to remove the item from the library.